NORTH BAY, Ont. – Cam Dineen and Mathew Santos each had one goal and three assists to pace the North Bay Battalion to a 6-3 Ontario Hockey League victory Thursday over the Mississauga Steelheads in the Troops’ annual New Year’s Eve game. 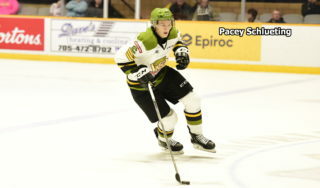 Mike Amadio scored two goals, including a shorthanded empty-netter, and added one assist, while Kyle Wood had one goal and one assist and Kyle Potts also scored for the Battalion, which improved its won-lost-extended record to 18-13-3 for 39 points, tied with the Niagara IceDogs for third place in the Central Division at the halfway point in its schedule. Goaltender Jake Smith made 27 saves before a festive crowd of 3,680 at Memorial Gardens as the Troops registered a seventh consecutive home-ice win. 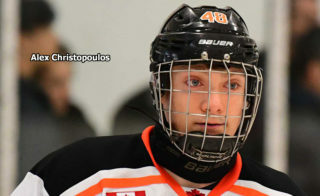 Daniel De Sousa, Daniel Muzito-Bagenda and Owen Tippett each had one goal and one assist for Mississauga, which lost a fifth straight game and is 18-16-4 for 40 points, second in the division. Starting goaltender Jack Flinn allowed three goals on 14 shots before Joseph Murdaca came on in relief and surrendered two goals on 10 shots. Dineen scored first, unassisted at 6:23 of the first period. He intercepted a clearing attempt, slid into the high slot and snapped a wrister that beat Flinn, effectively screened by Daniil Vertiy, low to the glove side. The goal was defenceman Dineen’s fifth of the season. The teams were skating four a side when rearguard De Sousa replied at 16:23, but the Troops capitalized on the time left in a kneeing major issued to Damian Bourne when defenceman Wood connected at 17:48. 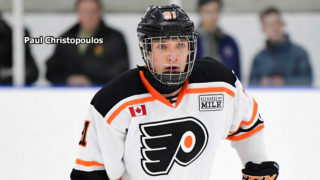 Woods’s fourth goal was assisted by Amadio and Dineen. The hapless Flinn got the hook after giving up a Santos goal from the right-wing boards at the blue line 13 seconds into the second period. Santos then set up what proved to be the winner at 4:11, racing down the left wing, cutting to the net and forcing Murdaca to make a save before Potts converted the rebound. Brady Lyle earned the second assist on Potts’s third goal, his second in two games. Muzito-Bagenda scored at 16:12 when he converted a bounce off the end boards, and Tippett pulled the Steelheads, who should have been long out of the game, within 4-3 at 6:07 of the third period, snapping a Muzito-Bagenda pass over Smith’s stick from deep in the right circle. Amadio restored North Bay’s two-goal lead at 13:41. Santos drove hard to the net off the left wing and shoveled the puck to Amadio, who fired it into an open net. The Battalion was a man short when Murdaca went to the bench for a sixth skater with 1:40 left. Santos carried the puck into Mississauga territory and fed it to Amadio, who fought off Stefan LeBlanc to complete the scoring. Rookie Dineen, who also assisted on Amadio’s team-high 22nd goal, leads OHL blueliners in scoring with 31 points in 34 games. Amadio was given an unsportsmanlike conduct penalty for tapping the pants of the prostrate LeBlanc after the goal, but De Sousa, who delivered a spear at the final buzzer, received no penalty for that act. The Battalion visits the Barrie Colts at 7:30 p.m. Saturday to open a home-and-home series that continues Sunday at 2 p.m. The game at Barrie can be seen live in North Bay on TVCogeco Cable 12 and heard on Country 600 CKAT. 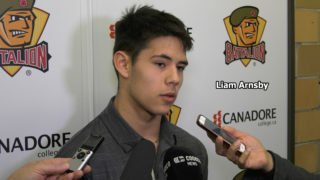 BATTALION BULLETS: The Battalion has an all-time won-lost-tied record of 15-2-1 on Dec. 31. The Steelheads, including in previous incarnations as both the Toronto and Mississauga St. Michael’s Majors, have been the opposition seven times, the first six at Brampton … Game sponsor Knox Insurance held raffles for a FitBit physical-activity tracker and an iPad mini. There also were gift cards from area businesses for seat-draw winners … Amadio, who eclipsed Howie Martin for sole possession of ninth place on the franchise points list, has 64 goals and 114 assists for 178 points in 229 games. 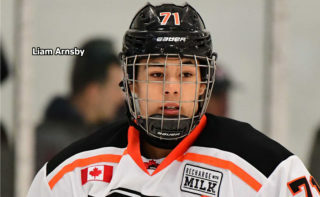 He has eight shorthanded goals, third in Battalion history, and his five shorthanded goals this season are tied with the London Knights’ Mitchell Marner for the OHL lead. The Troops top the league with 16 shorthanded goals … The Battalion posted a won-lost-extended record of 6-3-1 in December … North Bay was 1-for-2 on the power play. 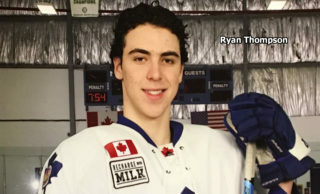 Mississauga went 0-for-5 … The Battalion scratched Jake Ramalho and Jacob Ball … Steelheads centre Michael McLeod served the second game of a three-game suspension. Mississauga also was without right winger Alexander Nylander, who’s with Sweden in the World Junior Championship at Helsinki. Nylander and MacLeod are first and second in team scoring with 49 and 42 points respectively.